"We are extremely satisfied with the Vandal Resistant High Capacity Jumbo Roll tissue dispenser. As our existing dispensers break or get broken, we replace them with this great product. Having a clean restroom is important to modern day libraries that strive to provide a welcoming environment to the cities citizens. Sadly, libraries are often at the forefront of the homeless crises that has arisen in the last couple of decades. As a public facility, there is an obligation to be open and accessible to all clients. That being said, many homeless populations make use of the restrooms and attempt to pilfer the paper supplies. Vandal Stop products has been helping public libraries now for decades to stop costly vandalism and destruction to the dispensers and also the costly theft of paper and soap supplies. 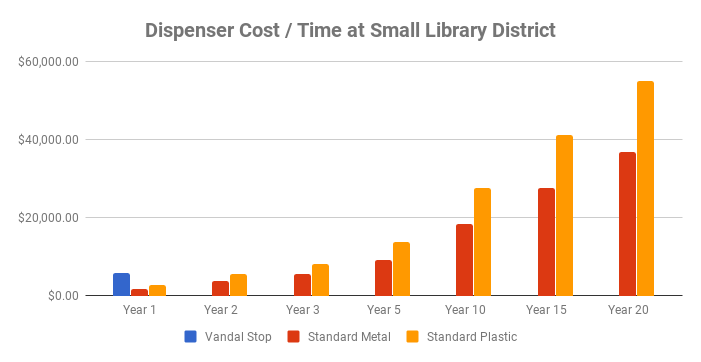 As an example, a small library district with just 3 locations and an estimated 18 bathroom stalls can save between $33,000 and $55,000 over a twenty year period by switching to Vandal Stop toilet paper dispensers, mirrors and soap dispensers. We can deliver these results because of our industry leading 12 gauge stainless steel material that we use for our vandal resistant products. We then specify 3/8" mounting hardware to ensure that the dispensers cannot be kicked off of the wall by vandals. Finally, our products are able to be secured with heavy duty padlocks that provide real security that is not easily compromised. We are so confident in our products ability to stop pricey vandalism incidents that we back our products up with an industry leading 10 year standard and 20 year optional warranty against vandalism when the product is properly installed and locked while in service. If for any reason an attack occurs that renders the dispenser inoperable, return it to us and we will repair our replace at our discretion.